The Paiute Cutthroat trout (Salmo clarkii seleniris),is native to the East Carson River watershed. It is hypothesized that the Paiutes separated from the Lahontan Cutthroats living in the lower Carson River Drainage. Through the centuries the color of the Paiutes has become quite similar to that of the Golden Trout. The trout was originally described by J.O. Snyder in 1933 from trout collected in Fish Valley, Alpine County. He named it "seleniris" for its resemblance to the rainbow of the moon. The last known species were located in Silver King Creek, Alpine County. These fish have been moved to the portion of Silver King Creek above Llewellyn Falls and it's tributaries. Most of the fish have hybridized with Rainbows while there are still some pure populations in Fly Valley Creek, Four-mile Canyon Creek, Coral Valley Creek and Coyote Valley Creek. The DFG also moved pure strains to the North Fork of Cottonwood Creek and Cabin Creek in the White Mountains (Mono County), Stairway Creek (Madera County), and Sharktooth Creek (Fresno County) as a means to protect the strain. Figures are that only about 500 pure strain Paiute Cutthroats exist today, making it the rarest trout in California. Currently the Paiute is listed federally as "Threatened" on the Endangered Species list. The two primary reasons are loss of habitat through overgrazing and the introduction of non-native trout species diluting their genetic character.Their demise has been loss of habitat and the introduction of nonnative species, Rainbow and Brown trout, to the region. The only pure strains within Silver King Creek exist above Llewellyn Falls. It is believed from a U.S. Fish and Wildlife report that, in 1912, a nineteen year old shepard named Joe Jaunsaras, transplanted some Paiute Cutthroats from below Llewellyn Falls to the waters above it. These trout were in turn transplanted by French Canadian lumbermen and shepards to several other streams in the Silver King Valley. The fishery above Llewellyn Falls was closed in 1934 and remains closed as of today. Unfortunately, in 1949, a pack train stocking rainbow trout fry in a nearby drainage took a wrong turn on the trail and mistakenly stocked Silver King Creek above the falls. Hybrdization devasted the population except for tiny tributaries. In addition, the State of California in 1950 decided to plant Rainbows and Lahonton Cutthroats below Llewellyn Falls which interbred with the remaining Paiutes. The State has tried to eliminate the hydrid trout below Llewellyn Falls with poisonings in the early 1990's to restore the pure strain Paiutes to this area. However, rainbow-cutthroats still exist within the area and rainbow planting still exists in the Carson drainage downstream from Silver King Creek. The state wants to continue poisonings but debates are currently underway as to whether rotenone poisonings is a viable method to eliminate the hybrids since the poisons also effect most of the other aquatic ecology of the stream. The Paiute Cutthroat can be distinguished from other cutthroats by the near absence of any body spots. The trait can be especially helpful in differentiating between Lahonton Cutthroat and the Paiute Cutthroat. The Lahonton has 50-100 body spots whereas the Paiute rarely has more than 5. The body color of the Paiute is yellowish to light green whereas the Lahonton has a coppery to purplish-pink body color. Once the fish are hybridized, there can be considerable spotting. As with all cutthroats, a distinct orange-red cutthroat mark will appear below the jaw. The Paiute has also developed "parr marks" which are dark blotches along the sides. 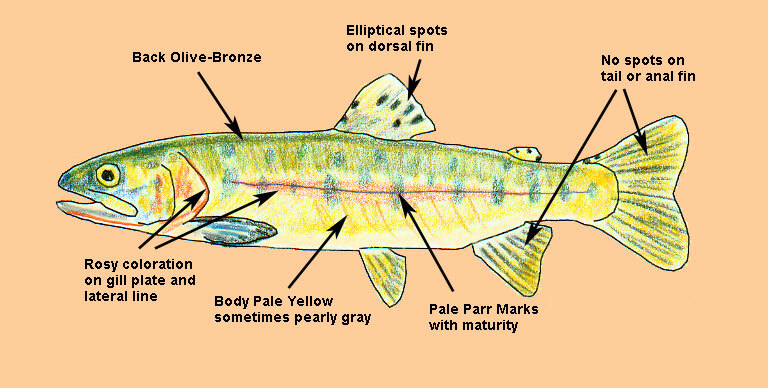 This is also a distinctive trait seen in the Golden Trout. The average size of these trout are only about 6 inches due to the poor nutrients found within their existing habitat.